Samantha continues to raise the bar higher. America's favorite travel guru brings you a bigger-than-before collection of durable, attractive luggage pieces you can count on. Designed with a variety of pockets and handy accessories, this fashionable set provides sensible storage solutions that make packing easier. The dowel bag's front padded pocket is perfect for tablet storage, while the clear-top packing cubes let you organize and stow more. 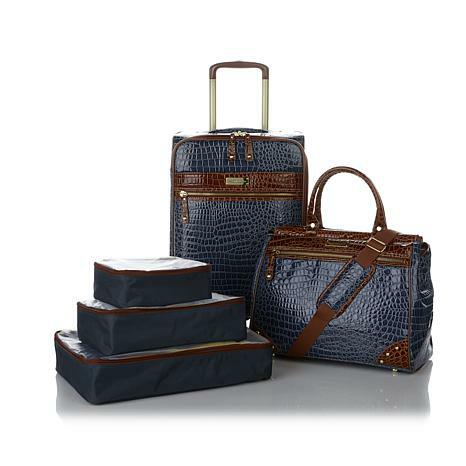 Whether heading on a week-long vacation or an overnight stay, this attractive travel set helps you arrive in style. Maximum Capacity: Approx. 40 lbs. Maximum Capacity: Approx. 15 lbs. Please bring back this 3pc set. I would love to get my daughter one in navy.love the tote. I absolutely LOVE my luggage! I can actually pack more & carry less! With many airlines charging baggage fees, not only is carry less easier, it can save you money! This is the best travel investment Ive ever made! 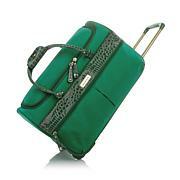 I decided to purchase this travel wear due to my new job that requires some travel. I figured, new job, new year and fabulous new luggage. I have not used it yet but the style is so elegant and eye catching. I did test out the travel cubes and I was able to pack 2 weeks worth of clothing comfortably! Friendly skies, here I come in style! I Love Anything Samantha Brown! 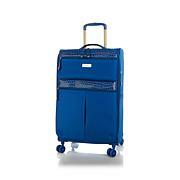 I bought another piece of luggage from Samantha Brown and I don't even need it. 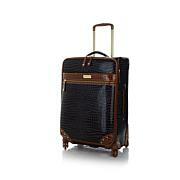 I love her lightweight luggage, but I just had to have a Croco set. I grabbed this set, because I noticed that she changed her lining in her newer pieces.I DO NOT LIKE THE LINING WITH THE BLUE CIRCLES SAMANTHA. I hope that it was just for that luggage and that you will bring back the yellow lining with the passports and Country landmarks on them. PLEASE DON'T USE THE BLUE LINING ON THE NEXT TODAY'S SPECIAL. One of the best investments Ive made! 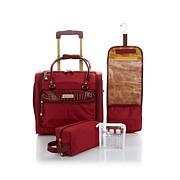 If you are looking for style, durability, affordability, and a luxurious look, then this set is for you. This is one classy set. Im so glad that I finally placed my order. I actually purchased the 25 upright to complete the set for longer trips. As soon as the watermelon becomes available, I will order that set as well!!!!! !